The McKay Reservoir isn’t the only trouble spot in the region. The National Weather Service calls for an 80 percent chance of rain after 12 noon, lasting until around midnight. Sunday’s forecast is for partly sunny skies with a chance of showers beginning early Monday morning. A flood warning still exists for the Umatilla River at Pendleton that could impact river conditions in Echo and Hermiston as the high waters move towards the Columbia River. Area streams and creeks are also reported to be overflowing their banks. A flood warning is also in effect for the Walla Walla River near Touchet and the Umatilla River near Gibbon. 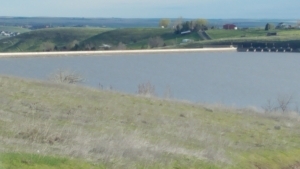 As for those living along McKay Creek in Pendleton, the Bureau of Reclamation continues to release water from the reservoir into McKay Creek at up to 2,500 cubic feet per second. At last report, 2,400 cfs were being released. Flows into the reservoir peaked yesterday at about 3,500 cfs but have leveled off to around 2,500 cfs this morning. The American Red Cross is operating an emergency shelter at the Pendleton Convention Center. Anyone who needs to move away from high waters is welcome. ARC says just show up, no pre-registration is required.